This is one in a series of posts that presents some of the key findings. Read other posts about housing and universal design, transportation, and fostering social interaction for all ages. Today, Dot, an older adult like many others in our communities, is going without food. Dot takes medicine for a health condition that she should consume with food. Her limited income requires her to make tough choices that ultimately lead to her hunger and potentially unhealthy medical outcomes. Policy and planning interventions around food access at the local level can help avoid the daily occurrence of Dot’s story and improve the lives of older adults. Currently over 42 million people struggle with hunger in the United States, and more than 5.4 million seniors do not get enough food. Food is central to our whole understanding of creating Livable Communities for All Ages. According to Maslow’s Theory of Hierarchy of Needs, food is a basic human need. When thinking about how to achieve higher levels of personal fulfillment and personal growth, access to food is a critical variable in this equation. This includes access to a diversity of food resources that support an older adult’s opportunity for having what is considered an overall healthy diet. According to the Centers for Disease Control and Prevention (CDC) the concept of the food environment describes the location of where individuals live and the proximity to where accessible food is located. In the context of creating Livable Communities for All Ages and determining whether an older adult can experience healthy and independent living, we must consider a person’s food environment. For instance, an older adult already residing in resource poor food environment may never achieve what we define as healthy living because the intensity of the potential investment necessary to reduce high levels of food insecurity. A planner’s role is to think about these relationships and develop strategies or policy recommendations that remove these barriers. Planners’ access to simple mapping can bring to life the reality of food access for many of their residents in their communities. 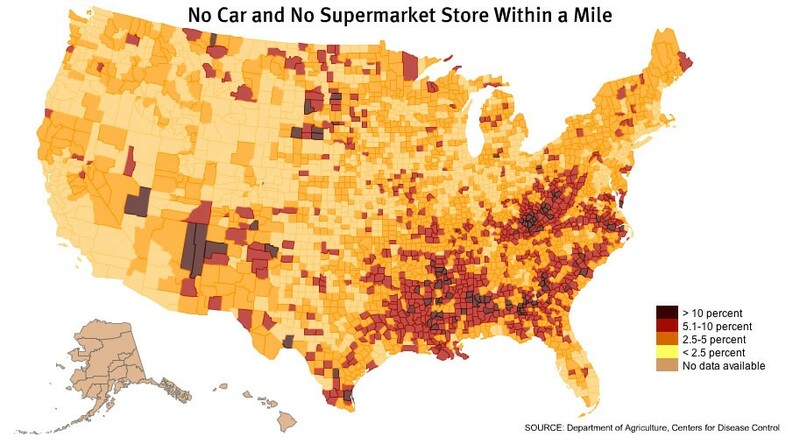 For example, the American Nutrition Association provides data on the number of individuals in the United States living in a household without an automobile and no supermarket located within a mile of their residence. For many individuals living in the southern part of the country the struggle with food insecurity is a daily reality. Technology and visual awareness allows us to consider the relationship between where people live and where they access food as an integral part of the planning process. Map of food access. Image courtesy American Nutrition Association. Aging professionals are an important resource to planners in the conversation on food access. County departments of aging services have relied on funding through the Older Americans Act for decades to tackle issues of food insecurity for older adults residing in our communities. You may be familiar with some of these programs such as Meals on Wheels or congregate meal services provided at local senior centers. Coordination between aging professionals and planners can also bring to the surface issues that older adults may experience with their nutrition as they age or financial insecurity creating their limitations to access healthy food. Certain challenges in reducing food insecurity continue to be pervasive for older adults and are an important part of the narrative in planning Livable Communities for All Ages. First and foremost, hunger hides. Since 2010, the threat of hunger for older adults aged 60 and older has increased 78 percent. For persons in general, it is hard to find healthy and inexpensive food in many communities, many food programs are not sensitive to the needs of our older adult immigrant populations, and chronically poor older adults move into poverty. Finally, we must be sensitive that, while the idea is well intentioned, not every solution to improving food access is the creation of a community garden. Mapping creates a visual story of our communities and can foster community engagement creating a voice for older adults. Data provides an important narrative of the locational and relational associations between where people live in our communities and where healthy food is located. Planners should consider locational and relational data to examine associations between vulnerable populations, community gardens, grocery stores, farmer’s markets, restaurants, and food banks. The next steps for planners is discussing the realities of their community’s food environment with elected officials. 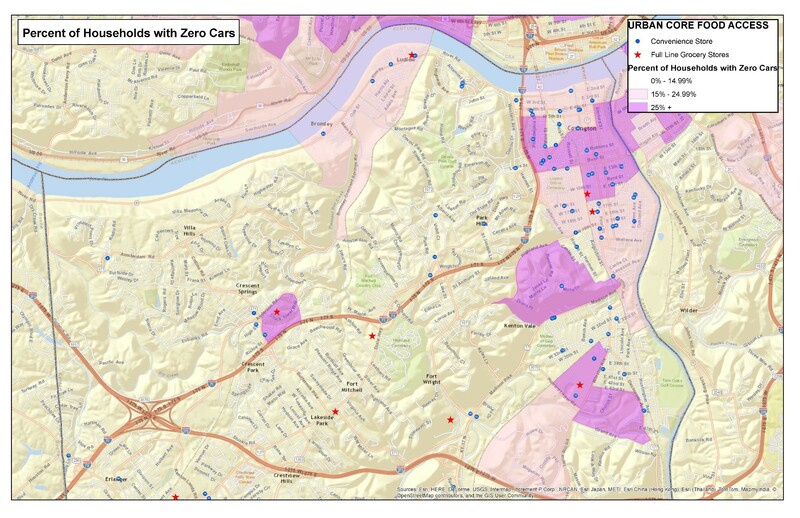 The Plan4Health project in Kenton County, Kentucky, mapped food access before launching its healthy corner store program. Learn more about story mapping from the project in Kenton County, and view the coalition's own story map here. Consider relationships between current and new housing for older adults and the location of food resources. Planners play an important role in negotiating the zoning or regulatory changes that may need to occur to allow some of these policies to advance. Leverage entrepreneurial approaches (congregate meal location in restaurants). Focus on need at the neighborhood scale and creative solutions to overcome access challenges (smaller markets, food trucks, delivery). Emphasize attention to cultural awareness and competency (local food needs of residents; SNAP). Advance opportunities on the zero-food waste approach (Second Harvest Food Banks and food redistribution). This site includes many important resources to learn more about hunger and food insecurity for the older adult populations . Top image: Older adults enjoying a farmers market. Pixabay image. Laura Keyes, PhD, AICP, is a lecturer in nonprofit management in the Department of Public Administration at the University of North Texas. Her doctoral dissertation examined age-friendly cities. Prior to embarking on doctoral studies, Keyes served as the manager of community planning and development in Atlanta’s Area Agency on Aging. She has published her research specific to aging policy in Public Administration Quarterly (2017), the Journal of Administrative Theory and Praxis (2016), Journal of Ageing in Emerging Economies (2015), and Journal of Aging & Social Policy (2014).